So far we have received 4 reviews of Suffragette: The Battle for Equality . 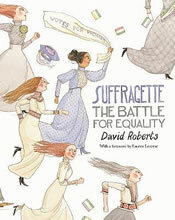 Suffragettes was a an amazing book filled with equality rights and interesting facts. I found this book fascinating and I loved learning about independent women memorable events in history and more! Anybody with a strong positive personality would adore this book and would not be able to put this book down! I certainly enjoyed this book! I know that when you read the title for this book you will have no idea what it is on about. I will tell you. It is about women fighting for the vote and how horrible prison was back then. My favourite part is when it tells you about what prison was like when you went on hunger strike. My least favourite part was when one of the suffragettes dies. I won't tell you who though! Would you like to find out how women won the vote? If so, read this book! Read it NOW! I rated this book a 4 because I thought it gave you a bit of information about how women got the vote and what happened ages a go I found it a bit boring I would recommend this book if you want to know how women won the vote then read this book and see if you like it but read this anyway. Suffragettes was a very good book. It was full of information and very useful information too. It was a bit boring in places because it was dragging it along a bit. Overall this book is good for people who like information books and like learning new things.